•	From my June 15th blog where I wrote of old matchbooks, ticket stubs and such that I kept in an old pickle jar from my high school days came a light-hearted moment from one of my old classmates. On Facebook she commented that the old ticket stub that I had pictured on my blog was from the night that she first met her husband back on August 29th 1981. She offered me a nickel for it. I, knowing that small town Postmasters like her only make like twenty cents a year, offered it to her for free since my chance at winning the GRAND PRIZE of a microwave oven had probably passed in the thirty-three years since. I handed it to her at our 30th class reunion a few weeks ago AND it was great seeing everyone who attended…all ten of us (we had a small class of twenty-four kids…so we got almost half of us…and had a great time). Honestly…I’d like to be around these people a little more often than just every five years….they’re great people and I like them more now than when we were in high school. 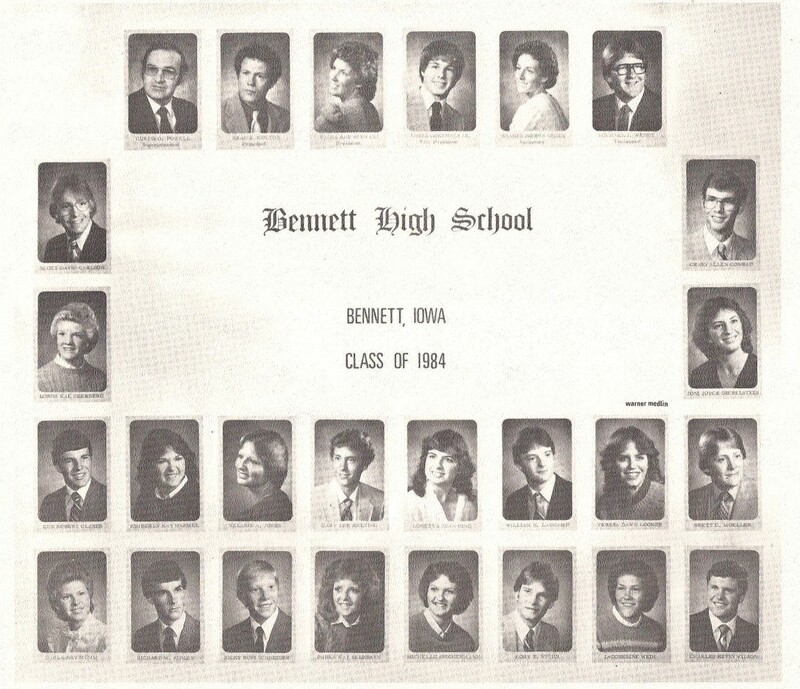 The Class of Bennett High School 1984. I didn’t smile. I thought that I looked goofy enough already. •	Rain rain go away!!! I’ve had rain out and postponement one after the other this late into the baseball season. It’s a letdown not to work these games but, quite honestly there are a lot of folks hurting with the flooding and storm damage that Eastern Iowa has endured these past few weeks. Bridges washing out on highways, kids getting swept into storm drains, basements flooded and ancient trees being felled by gale force winds of violent thunderstorms sweeping across the state of Iowa. My games in northeast Iowa are still on for tonight, fingers crossed. •	Over the weekend I attended a basketball camp at Drake University in Des Moines. In a nutshell these clinics are where I PAY money to officiate in front of evaluators that watch me officiate basketball games then tell me what they think I’m doing wrong or could do better. Conference assigners are there as well and, if they like what they see in you, you’ll get some games assigned to you in their conferences (the assigners and evaluators are sometimes the same person). It was kind of a letdown, plain and simple. Firstly…I wasn’t my best. For whatever reason I didn’t work those games like I had during the season. I was quiet. Not as many officials signed up for the camp so instead of just working three games a day we worked as many as five (a guy gets tired and real hungry is all I’m saying). One evaluator told me that I looked “robotic” and asked me to be “more fluid…more human…you know…approachable.” My mentor told me long ago to just keep my mouth shut in these situations and to nod “yes” in agreement. I tried my best to be the good soldier but my mouth finally got the best of me and I asked “why is it wrong to do it the way that I’m currently doing it when last summer I was told it was “great” by someone you employ?” The evaluator smiled and replied “he’s a nice man, we appreciate what he does for us but if you want to do it correctly…do it this way.” Fair enough….I’ve changed to his way as he’s higher up on the food chain, and honestly…it’s easier to officiate his way. I did receive some real nice compliments from the evaluators, but obviously….there’s room for improvement in my game and that’s what I’ll focus on from here on out. I also found out that there’s no way that I want to be a college basketball official. While it’s good for many folks I don’t think that I’d enjoy being under that much scrutiny. Guys were told everything from that they needed to lose weight, to run differently (as their running now looked awkward) to guys coming off a knee surgery and running up and down the court with kids as the assigners looked on to see how they were holding up. I probably should have mentioned that the clinic was for both college and high school officials, but not many high school officials signed up so I was put with the college officials. They, thank God, taught me the most. Honest, unassuming, helpful and with years of game management experience, they were the silver lining of that clinic. My wife just returned from a trip to Japan where she stayed with our daughter who’s attending college in Tokyo. She had a blast, even tried eating horse at a fancy restaurant (she didn’t order it…the host family did as part of a six course meal). From what Connie’s said….I don’t think that it’ll catch on over here in the States anytime soon. I love pulled pork…if they don’t have pulled pork in Japan….I won’t be going. Nuf said. As always…thanks for reading, stay safe and God bless.